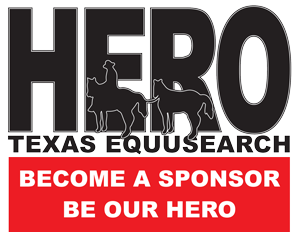 The shield of Texas EquuSearch was first introduced in 2006. Since then various versions have appeared with minor modifications. As of June 22, 2017 we are introducing a major update to the shield. 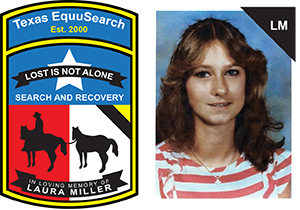 Banner Tribute to Laura Miller: Texas EquuSearch is dedicated to the memory of Laura Miller, the daughter of our founder Tim Miller, who was abducted and murdered in 1984. Tim is fond of saying “Don’t thank me, thank Laura” when someone compliments him about the work of Texas EquuSearch. It was out of that tragedy that thousands of families have been helped and hundreds of people have been brought home safe. Tribute to Deceased and Still Missing: The black band in the upper right corner or the white section of the Texas flag background is intended for the hundreds of missing persons whose remains have been found by Texas EquuSearch. The yellow triangle in the same area is meant as a tribute to those that are still missing… in hope that they will one day be brought home. Lost is Not Alone Banner: Lost is Not Alone is the motto of Texas EquuSearch. The words apply to both the missing and their loved ones. While 750,000 people are reported missing each year in the United States, every family dealing with this situation feels helpless and alone. We are there to provide hope and assistance to these families. Missing Rider: The horses with a missing rider is a symbol we use in a number of ways and has become one of our main logos. It is a reminder of our beginnings as a mounted volunteer search and recovery team or as Tim Miller says “back when we were hillbillies on horseback.” Today the team has grown to include 1,000+ searchers on foot, horseback, all-terrain vehicles and water craft who utilize technologies such as side-scan sonar, ground penetrating radar and aerial drones. Texas Flag: The background of the shield is the state flag of Texas. While we have conducted searches in 42 of the US states and have chapters in both Ohio and Florida, we will never lose the Texan spirit.